It has been decided that 「Musical Goong」, which became a hot topic after Tohoshinki’s Yunho was casted in it, will hold its performance in Minami-za, Japan, this coming June. The Korean drama about romance in the imperial house, 「宮～Love in Palace」, was a big hit as it created a social phenomenon across 23 countries, and it was turned into a musical last year. In its first performance in Seoul, Tohoshinki’s Yunho performed the lead role of the Crown Prince Shin, drawing in more than 5000 Japanese audience. With the development of a comical story and splendid costumes that utilizes traditional beauty, there was also a hip-hop dance battle that drew a lot of interest. The 「Musical Goong」, which was also recognized as one of the most original works in the Korean musical industry, will “power-up” with a brand new cast, stage direction and stage design, and show it off in Japan. Information on the cast as well as ticket release dates will be announced on the 「Musical Goong」 official home page （http://www.musical-k.com/）. Yunho asked, “Did everybody have fun today?” To which fans scream yes. He then says, “I see. Today, all the Goong concert at Yong is finished. I had lots of fun too.” He kind of starts to stutter here. He says, “Today, there were lots of adlibs along the way and for the last concert, we tried to show everyone a fresh/new side as much as we could. Did you have fun?” To which audience screams yes again. He says, “I was really happy today too. Thank you.” He then speaks Japanese. Afterwards, he speaks Korean again and says that there were really a lot of people who helped along the way while doing Goong concerts. That’s why he prepared a list and wrote down names of all so he doesn’t leave out anyone. He then proceeds to thank producer/companies/org. Afterwards, he says, “Even though today is the last concert, there are actually other stars in Goong who didn’t get to perform together (that day).” He gets tongue tied here and he pretends to slap himself and says, “Why can’t I talk today?” To which everyone laughs. Then Yunho says, “I was really happy to stand as Lee Shin in musical Goong (Run scoots Yunho over), ah, yes, for the end, we want to sing the encore song together with everyone. Everyone, is that alright? Shall we have a go at it?” He then says something in Japanese. Finally, he says, “Then let’s go. 1,2,3,4”..and they start singing the encore. Why did Park Soojin and U-Know Yunho act as a couple in the waiting room during the Goong Musical? 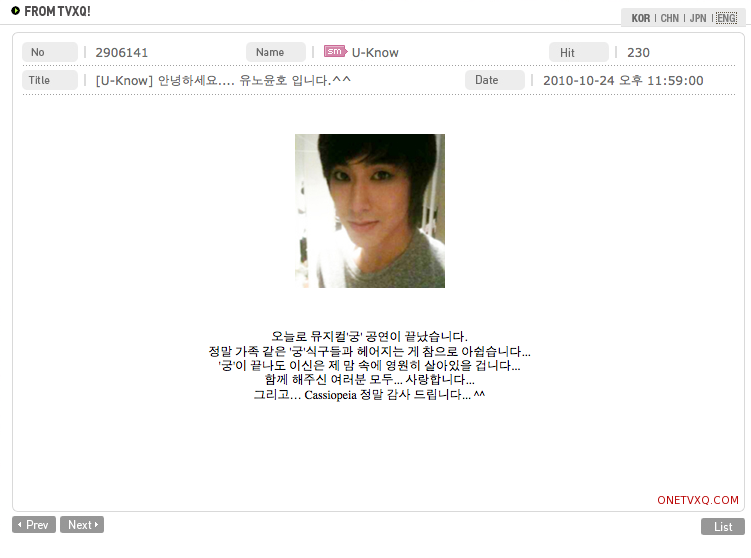 It was initiated by the ‘Crown Prince,’ Yunho. The photo taken by the two in the waiting room added interest and attention to the musical. Starting from the 9th of September to the 24th, U-Know Yunho took on the role of the Crown Prince in the musical “Goong” which was held at the National Central Arts Museum. The musical “Goong,” like “Phantom of the Opera,” “Miss Saigon,” and “Cats,” has overcome the restrictions of a staged musical, being created purely as a national composition. The biggest attraction of this musical is said to be its mixture of music from previous periods and classical music with hip-hop and jazz. The blend of ballet and dances from older eras with street dancing and music is also said to be one of the musical’s biggest charms. Starting from last month, U-Know Yunho’s performance in “Goong,” with narrations as well as break dancing, have resulted in good and positive reviews on the musical. Because of U-Know Yunho, the musical not only received support from Korean fans, but also from a huge amount of both Japanese and international fans. On the 9th of the previous month, fans sent in 3.1 tons of food to the venue of U-Know Yunho’s first performance. During the press conference for the musical, the director of “Goong” said, “After practicing for approximately four months, U-Know Yunho put in a tremendous amount of hard work in becoming an actor for a musical instead of being an idol.” The director praised him and said that he liked Yunho’s leadership skills onstage, and that he looks forward to his growth as an actor in musicals in the future. 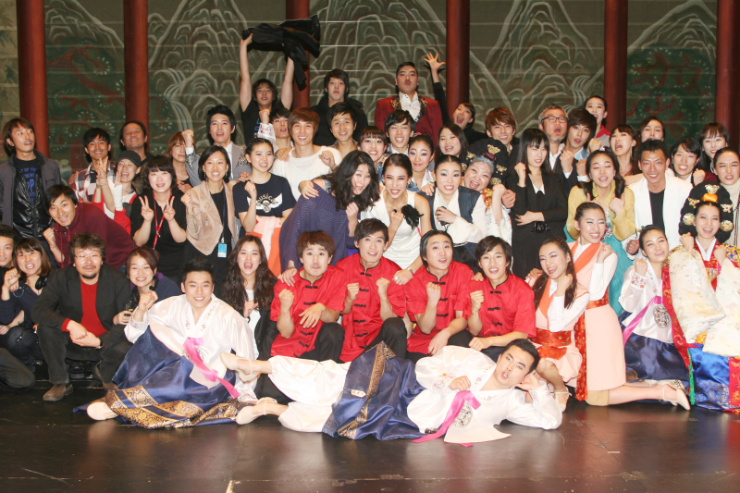 Japanese tourists came to watch musical ‘Goong’. After the curtain down and sent an off to the stage, loud applauses by audiences was followed. Japanese female audiences stood up and chanted, “Yunho! Yunho!” . 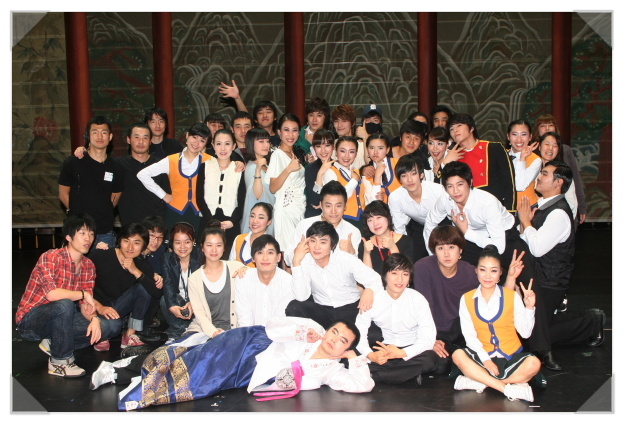 On that day, musical ‘Goong’ was presenting popular group TVXQ member Yunho. Eventhough the applauses volume increased more and more, however even after 5 minutes had passed, Yunho still did not re-appear (for curtain call). The audiences who had crossed the sea to watch the show, showed regrettable expressions, but they just smiled and gave another applause while picking up their belongings. Last 9th evening, musical ‘Goong’ that was performed in theatre in National Museum of Seoul was rather special. It’s because the audiences was only Japanese tourists (group audiences). All the 800 seats were filled with Japanese female in their 40 – 50, leaving the stage to flow with Japanese subtitles. The actors as well, freely used Japanese word “Wakarimasuka? (Do you understand?) a lot on stage. The audiences were all concentrating to see ‘His Royal Highness Crown Prince’ Yunho. Everytime he appeared, there would be an explosion of cheers. Even when he just removed one button on his suit, exclamation like “Wow~” was leaked out. One audience A-san who bought tour package for 3 days and 2 nights to watch musical ‘Goong’ said, “Yunho is really good in both singing and acting.” she added, “Eventhough I wasn’t able to get ticket for the last day, but I still want to come along.” When was asked about her age, she responded, “Can’t you see? I’m an oba-san (T/N: ahjumma in Korean) here.” The other audience B-san, “There’s never a Korean idol whose presence and charisma almost reach perfection like this.” as she claimed. It’s tough for actors to give breath to characters that are taken from comics. Despite Yunho still showed a stiff acting, yet his singing and dancing were stable. There was also a LED video which was fairly functional in some of the scenes, however it made the performance a bit lacking in aesthetics department. Yet, satisfaction of the Japanese audience seemed to high. ‘Goong’ packaged goods sold in Japan were sold out on the launching day. The musical production company plans to proceed total 4 times performances specially for Japanese audiences. Meanwhile other TVXQ member Junsu is holding an event called “Kim Junsu Musical Concert” on October 7th – 10th in Seoul Olympic Park Gymnastics Stadium, the ticket which is being sold in Japanese travel agency is also gaining a lot of demands.